This series opens up with a woman searching for her car in an underground car park. When she gets to her car, she is attacked by a weird alien that looks like a cheap version of Spiderman's Iron Spider costume. Her suffering doesn't last for long, a Kamen Rider rushes in to save her. The evil alien summons some minions but they are no match for the Kamen Rider. The man who is working at the car park is weirded out, the aliens are invisible to him, so he thinks that Kamen Rider is just being weird. Kamen Rider defeats the aliens, then he de-morphs in front of the woman and the man, leaving them confused. Yes, it's time for my famous bonus segment that I like to do when I cover a first episode. (Or when I cover an episode that changes the intro.) Why am I covering it here? It's because that the intro takes place after the events of the paragraph above. There's nothing much to the intro. You get photos of the characters in the foreground and video of some of the action in the background. Video that has been color tinted, where you have no idea what is going on. This isn't the most entertaining intro that I have ever scene. It's quite the opposite because it is very boring. The only entertaining thing about the intro was the music. It's a hard rock sound that reminds me a lot of the band Trivium but with more cheesy lyrics. Okay, that's a lie. The lyrics are just as cheesy as a Trivium song but are also just as fun. (Hey! I really like Trivium. Don't send me all of your letter bombs or photos of your naked grandma.) Overall, boring and bland intro but thank goodness that it is short. Now back to the show. Next scene shows a father and his son at a police station. The son is in trouble for stealing some spark plugs and he swears that he didn't do it. His father lectures him and guess what? It was all just a dream. The son wakes up and we find out that he is at a police station for stealing some spark plugs and he swears that he didn't do it. The difference is that he hasn't got his father with him. Heavily implying that his dream was a memory and he has been arrested before for stealing spark plugs and swearing that he didn't do it. We also find out that it is also his eighteenth birthday. The son is lucky, no charges are being pressed against him and when he gets up to walk out, he sees his father in his reflection. His father tells him to search for the dragon and then the son leaves the station. We now cut to a book shop where a girl named Maya is doing some research about missing people and how there's a masked rider going around town. Maya's friend comes over and they chat about hillbilly fashion (yes, that's a thing) and then Maya takes off because she has a lead to the masked rider. Maya is out on the street doing some reporting and then she is attacked by the evil aliens but she is unaware because they are invisible to her. The son just happens to spot the aliens chasing Maya, so he jumps in and starts beating them up. The aliens take Maya and pull a Super Mario 64 by jumping though a painting. Maya is now in some weird new dimension. Next we hear Maya scream and then an alien gets thrown out of the painting by Kamen Rider (a de-morphed version that looks like the Terminator). 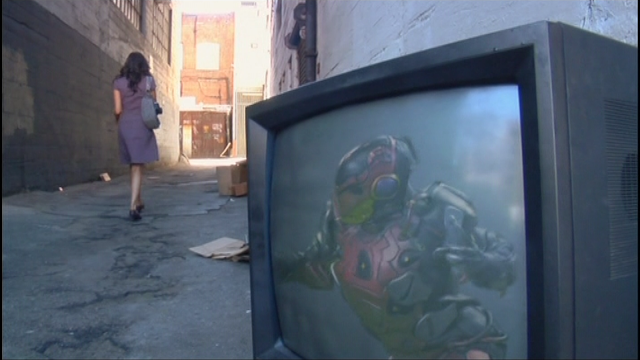 Kamen Rider saves Maya and starts kicking some more alien a**. The son is impressed with Kamen Rider's skill but Kamen Rider is only there for one thing. The son's deck. (The trading cards that he picked up from his dad's garage, ya sickos!) The son runs away and Maya picks up his wallet, where we are now finally getting his name revealed. The son's name is Kit Taylor. Kit runs around some more and then he gets attacked by a giant robo-spider and then he falls into a car (yes, into a car) where he is warped to the other dimension and transforms into Kamen Rider Dragon Knight. The other Kamen Rider saves Dragon Knight from being beaten up by Robo-spider but now we have another robo-monster joining the battle. 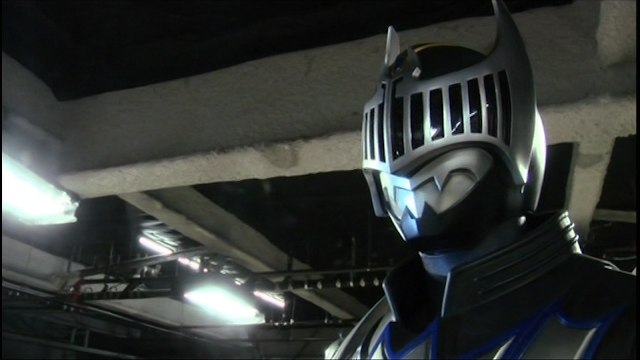 Dragon Knight watches the other Kamen Rider use his cards to summon weapons, then Dragon Knight gets the idea of how the cards work and joins in on the battle. Dragon Knight charges at Robo-spider with his sword but it breaks and then he is knocked back. 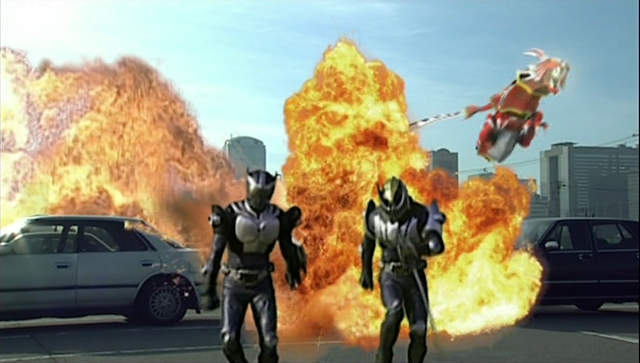 The other Kamen Rider uses his powers to defeat the robo-monsters and then they are chased by a dragon and that's all she wrote for this debut episode of Kamen Rider Dragon Knight. Just like the intro, nothing much is going on. You've got a split-screen where there's action packed clips from the show running on top and credits rolling down below. The music that plays is an instrumental track that sounds like a mixture between gothic and hard rock and it works. The credits are much more entertaining than the intro but it does lack the feeling of satisfaction knowing that I've just finished an episode. Overall, an okay outtro. There's nothing much going on with the story in this episode, it is mainly about introducing the main cast which isn't a bad thing. This episode also sets up what to expect from the show and it did a good job because it does make me curious and excited to see what this series has to offer. The characters are basic but enjoyable and they have a lot of mystery towards them, meaning that we should get some decent character development during the series. The acting is a bit wooden but it shows potential and hopefully the acting loosens up over the series. The thing I was really impressed with is that this show has a more mature feeling towards it just like that found in the Japanese Kamen Rider. Yup, we've come a long way since the goofy Masked Rider. If this show manages to keep this mature feeling up, this could be the best and most faithful English adaptation of a tokusatsu series. The action in this episode is awesome. Dragon Knight wasn't afraid to be a bit more violent than the typical English adaptation with some fights that actually look like fights. There's also actual peril and consequences making the fights fun and unpredictable. It's a real refreshing thing to see and I am disappointed that we haven't got any more adaptations like this. The biggest downside to this show is that it does feel too much like an adaptation of a show from the early 2000's. The story and effects are a little dated, especially with the costume department where it looks like everyone is dressed like they are from the year 2000. It would've been nice to make the show feel like when it was made to capture the era that it was from. I know that sounds weird but you'll understand once you've watched it. Overall, this was a pretty good introduction episode but far from perfect. I hope to see this series improve as it goes along and I am really excited to see more despite it's flaws. 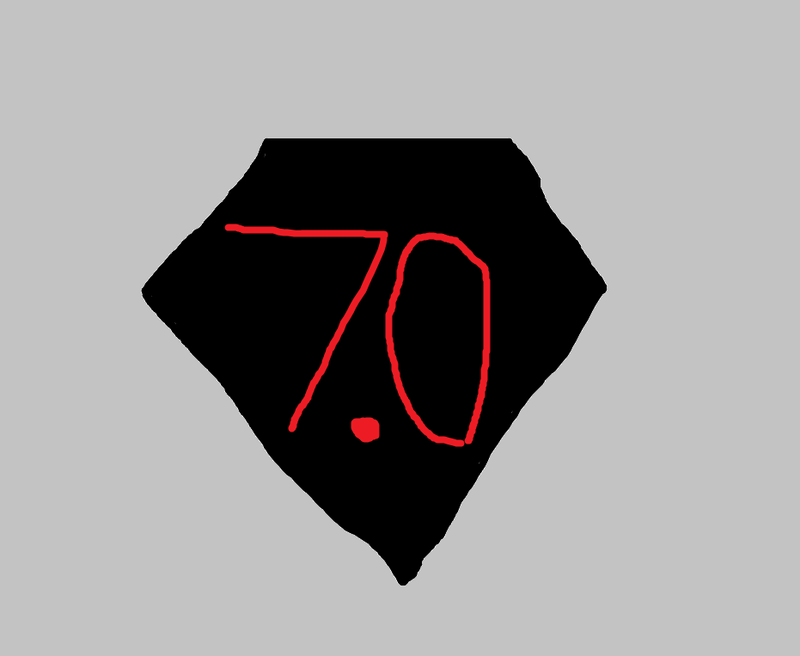 I'm giving this episode a 7 out of 10.